Did you know that all functions of the human body, if not properly eliminated, will pollute it? Diet, exercise, stress and worry produce acids in our body. The results can lead to obesity because obesity is the result of too much acid. We know from Dr. Youngs book, "The pH Miracle", that there is only one disease and its expressed on how we maintain the alkalinity of our body. The over-acidification of the body is due to an inverted way of thinking, eating and drinking. "Living to 100 -disease free- is not setting the goal high enough", says Dr. Young. Did you know you can have the bone density and blood of a 20 year old at any age if you alkalize the body to raise the electrolytes? 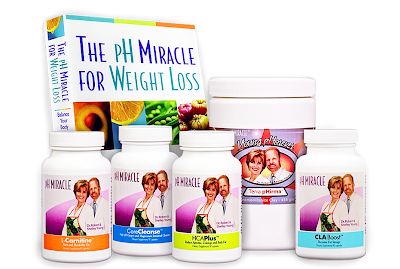 pH Miracle supplements are designed to help us take care of our body, balance our pH and alkalize for optimum health. ...that are on sale. -Every penny helps. God bless pH Miracle for understanding that point. L-Arginine MAX is another product you might also want to look at based on the issues expressed in the news. I have made my health and balancing my body pH a priority this year. I also intend on maintaining it. It takes maintaining daily and through the year of numerous events. Hopefully you will make the same investment in your health. Fasting from meat for two weeks can give you a wonderful start. Fasts really help your body recover from all the accumulation. BRAVO to you who are making a start!